Ok, there's about 30 minutes left of my work Friday, but in my mind it's already the weekend. I just read a review of Mark Wahlberg's latest movie, Shooter in Salon and I am reminded of just how much I like him. So to celebrate the beginning of the weekend, I thought I'd scour around on the internets and find you ladies (and men) some photos of men I find HOT. It's also finally much warmer around these parts with temps due to enter the 20s next week - woohoo!! 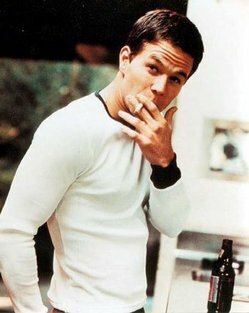 Marky Mark - Mmmmm. Did I tell you how excited I am about the new Entourage episodes airing from April 8?? 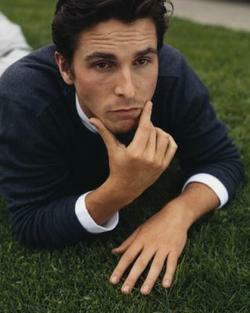 Now I've been a fan of Christian Bale ever since I saw Empire of the Sun. He just gets hotter and hotter. 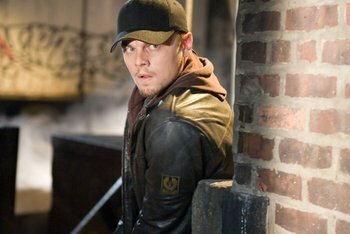 I have NEVER EVER been a fan of Leonardo DiCaprio, but after seeing the Departed I was surprised about how hot he was (in the movie). He's always looked like such a baby, but now I might have to rethink my list. He has a temporary position in the list until he can back up his new grown up man looks with another movie. Previous teen crushes include River Phoenix and F1 racing car driver, Ayrton Senna. So what actors/actresses do you think are hot? Share! Share! I'm totally sure I've forgotten some of my favourites. Well there's only 10 minutes of my shift left now - sweet! Hope you all have a great weekend and that spring is headed your way (if you are in the northern hemisphere that is)!!! I've been a little under the weather this week and have had no urge to do anything other than eat (not even knitting - I also lost the fifth needle of the dpns I am using for my knee-high stipey socks so they are on the back burner too - I might have to give that knitting socks with two circulars a go). 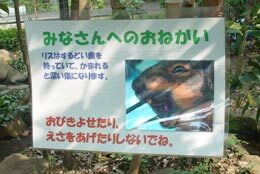 poster warning us of the DANGEROUS squirrels at the zoo!!! Rae and Claire in Rae's bathroom making margaritas!! So before you correct the spelling of this post's title - it is correct. Most Japanese people have a hard time pronouncing the 'th' sound, so when they talk about the upcoming (yes I know it's old news in absolutely every other country in the world) Star Wars movie, that's how Sith sounds. It kind of amuses me. I don't know why. Anyways, Japan is the last damn country in the world to show this movie - it finally starts on July 9, and I bought our advance purchase tickets. We don't go to the movies often in Japan because it's too damn expensive, but we like to go and see all the blockbusters (Lord of the Rings series, Kill Bill, etc). We decided not to see it in the US, and wait to see it in Japan. I tried to get hold of the Burger King chewie doll while I was there, after falling in love with Joy's, but I missed out by a week or so - they only had some other characters I wasn't interested in. Japan is celebrating the beginning of Star Wars with some limited edition converse sneakers and some storm trooper beach sandals. The bi-san (short for beach sandals in Japanese) seem kind of silly don't you think!! 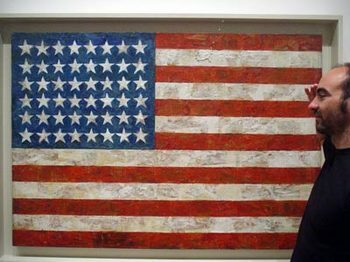 To all you Americans out there - have a great 4th of July weekend!! We'll be letting off some fireworks down in the park on Monday! The Nipper has tagged me again!!! Thanks girl! This time it's all about the movies. This would have to be Terminal with Tom Hanks. Actually I didn't really want to see this movie as I actually don't really like Tom Hanks, but that was the best choice I had at my local movie theatre when I wanted to 'get out of the cold the other day'. It was entertaining especially if you watch it while eating a tub of strawberries and drinking a mini bottle of red wine. The best movie I saw recently was Steamboy the latest 'anime' flick created by Ootmo Katsuhiro of Akira fame. It's a fantastic movie! Well, we rented the Mothman Prophecies yesterday (not knowing anything about it but we should have known considering it featured Richard Gere - in the later years), but I fell asleep about five minutes into the movie, so I guess that doesn't count. I think the last movie I stayed up the whole way through was American Splendor, which was super entertaining. Highly Recommended. Special mention is The Office - although not a movie - we watched it movie-style (at least three episodes in a row). We just finished watching the 2nd season (thanks, Rae!!) and although it was still really funny, I felt that it was a lot sadder than the 1st season. Is there any other tv show which makes you cringe so much??? In desperation we downloaded the Christmas Special yesterday and watched that too. Won't give away the ending for those that have not seen it yet. 3. How many movies do you own? Hmm, I would say about 30 or so - thanks to the super cheap black market dvds in both China and Thailand. I think it is important to mention that only about 25 of those work!!! 3a. What was the last movie you bought? Hmm, well we bought 9 dvds in Thailand including Supersize Me (stopped working half way through), Napolean Dynamite (what an awesome dance scene), 21 grams (loved Amores Perros but could this movie be more depressing???!!! ), Anchorman (stopped working half way through), Before Sunset (lots of talking but good), 50 First Dates (we love Adam Sandler), Princess Mononoke, Old School, and I can't remember the last movie!!! 4. Got Netflix (or a similar service)? I wish. Japan used to have something similar, but that didn't last. Darin and I did have Netflix for a while in the US and I loved it. When we move back, we will definitely be subscribers!! Trust - Hal Hartley movies are brilliant and this is the first one I ever watched. I love the crazy banter and the whole feel of these movies. Martin Donovan is also pretty cute. The Goonies - the ultimate adventure movie. It has everything and it reminds of the years when I used to buy teen heartthrob mags (e.g. Bop, Teen Beat). Did I ever tell you how obsessed I was with River Phoenix. I even have a hand-made River Phoenix scrapbook. Stand By Me - this movie rocked my world. I can remember my parents decided that they were going to go to the Casino for the night and in order to make sure we didn't complain they took us to the video store and we could choose any movies we wanted. I cried for Chris Chambers, fell in love with River Phoenix and bought the soundtrack - I could sing it to you to this day. Full Metal Jacket - the first war movie that I liked a lot. Welcome to the Dollhouse - to be honest it wasn't as funny the second time I watched it, but it was still awesome. It perfectly depicts the pain of growing up and the music is so special. Special mention: Sling Blade, Pulp Fiction, Charlie and the Chocolate Factory (can't believe Darin fell asleep!!! ), Dirty Dancing (maybe that should go in the guilty pleasure category - it was on when Darin and I decided to get married and he does the most awesome Patrick Swayze dance impression of the last scene), Star Wars, ET, etc. Wow, that was a hard list to compile. I am sure that there are a bunch of other movies that I could include, but I just can't remember them right now. Definitely teen movies - you know the ones that always have a music scene where they try on different clothing - damn I love those movies. It is a particular movie recipe that I fall for every time. Just watched Wimbledon on the plane and loved it and I am proud to say that here!! I don't know. If you read this and want to answer it email me and I'll send it to you. A cop-out I know, but a cop-out it must be. I have a nearly completed knitted item to post in the next couple of days - exciting, huh! Um, anyway...have you seen 'Lost in Translation'? I haven't, but I want to. I have had my doubts about this movie in terms of Japanese stereotypes, etc BUT everyone we have heard from RAVES about this movie. Hmmm, I still have my doubts, but I am keeping an open mind. If you have doubts too and even if you don't, then read this article that appeared in the Guardian and today's Sydney Morning Herald. It doesn't RAVE about the movie at all, but presents a different perspective from a Japanese/American woman. If you haven't watched Grease in a while, I highly recommend that you should rent it. It rocks. We also recently rented 'Pretty in Pink', and I kind of hate to say it, but it was pretty lame AND I always thought I loved Pretty in Pink. The characters were so sad in that movie - I mean...poor duckie. So, anyway back to Grease. It is such a fun movie to sing along to and John Travolta is such a classic - the dance scenes were just as great as ever. I love a movie that doesn't age. It's also really cool that there's an Aussie in it too. The one and only Olivia Newton-John. Even in Tokyo, Japan - one of the world's largest cities, you sometimes have to wait months to see major films. Every now and again a movie will be released at the same time as overseas, but this happens rarely. They also sometimes change the names of movies, which can cause havoc when looking for particular movies at the video store. There is a great interview with Toni Collette the Aussie actress about her role in Japanese Story (an Australian movie) in Salon. This is one of the movies that I want to see when I am back in Australia. I also want to see Lost in Translation. So many people have raved about this movie AND I WANT to see it ALREADY! Will also finally get to see the final installment of Lord of the Rings!! The final installment of the Lord of the Rings - The Return of the King - premieres in Wellington on Monday night. Although most of us await the release of the movie, there are some awaiting the release of the Return of the King trading card game. Are you one of those people???!! Well, the film opens in the US on Dec 17 and then in Australia on Boxing Day....and MUCH TO MY REGRET does not open in Japan until the Spring!!!! NOOOOOOO!!!! Why do they force me to try and download a pirated copy? Why do they encourage me to fly to China to buy a pirated copy? Why??!! The painting is behind the guy sitting in the middle of the page! !